An important feature in electric standing desk construction, the side brackets allow you mount your desktop onto your UPLIFT Desk base. 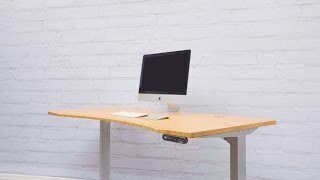 They are available in black, gray, or white to match your desk's finish and are compatible with all 2-leg and 3-leg UPLIFT Desks. Side brackets are sold individually. Why do I need a side bracket? Side brackets allow you mount your desktop onto your UPLIFT Desk base. If you are building out a DIY desk or need a new side bracket, this is for you. Will this work on my T-frame desk? No, Side Brackets for C-frame Desks are designed to work on c-frame desk bases only. Do I get to choose my side bracket's color? Yes! We offer side brackets in gray, black, and white to match with your UPLIFT Desk frame. Choose which UPLIFT C-Frame Desk Side Bracket you'll replace - left or right.